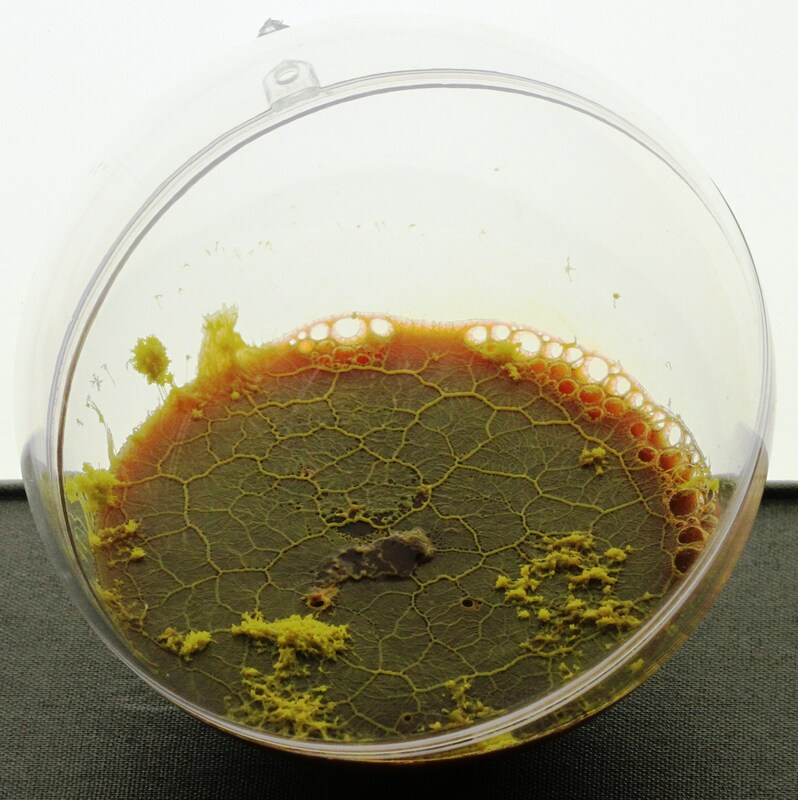 C-MOULD, is the world’s largest collection of microorganisms for use in the arts and design, with over 50 different kinds of microorganism. We have bacteria and fungi that glow in ethereal shades of green and blue light, bacteria that make antibiotics, gold and electrically conductive nanowires, and bacteria that produce biotextiles. 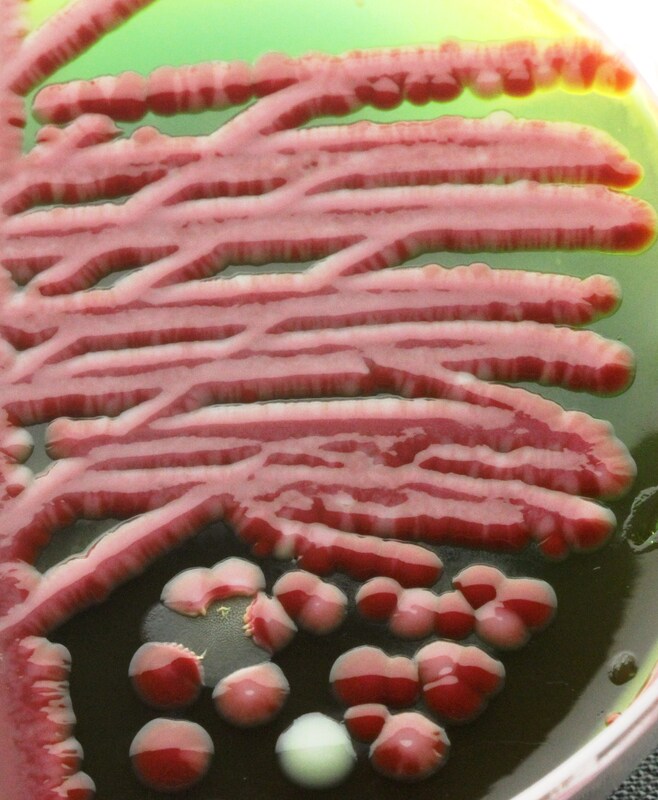 We also possess the largest collection of pigmented bacteria. To celebrate Christmas we have made a small collection of gifts, and unique and living Christmas tree decorations. 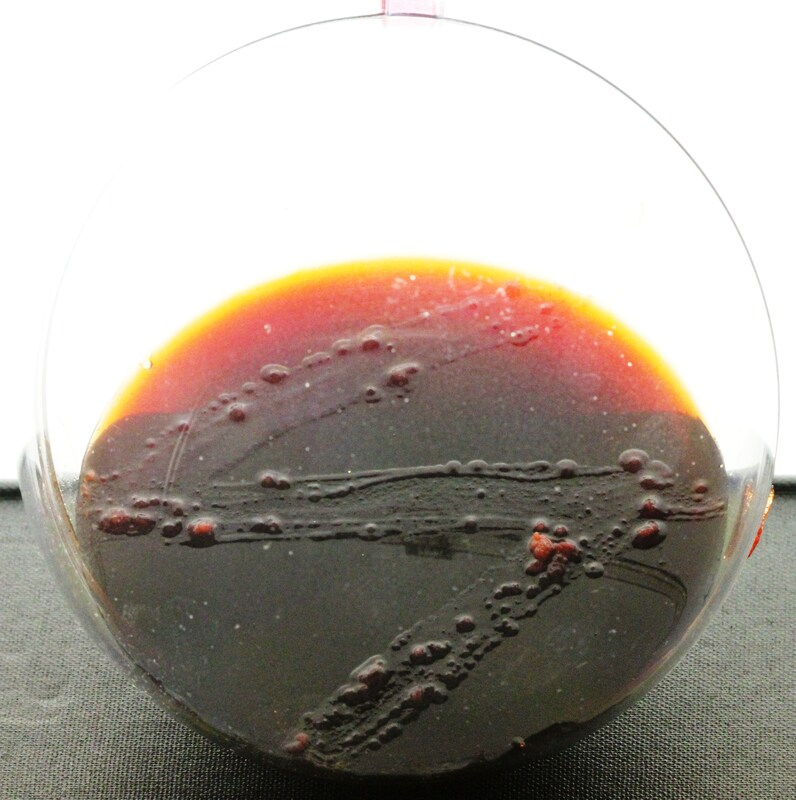 The Bacterial Gold Pendant. 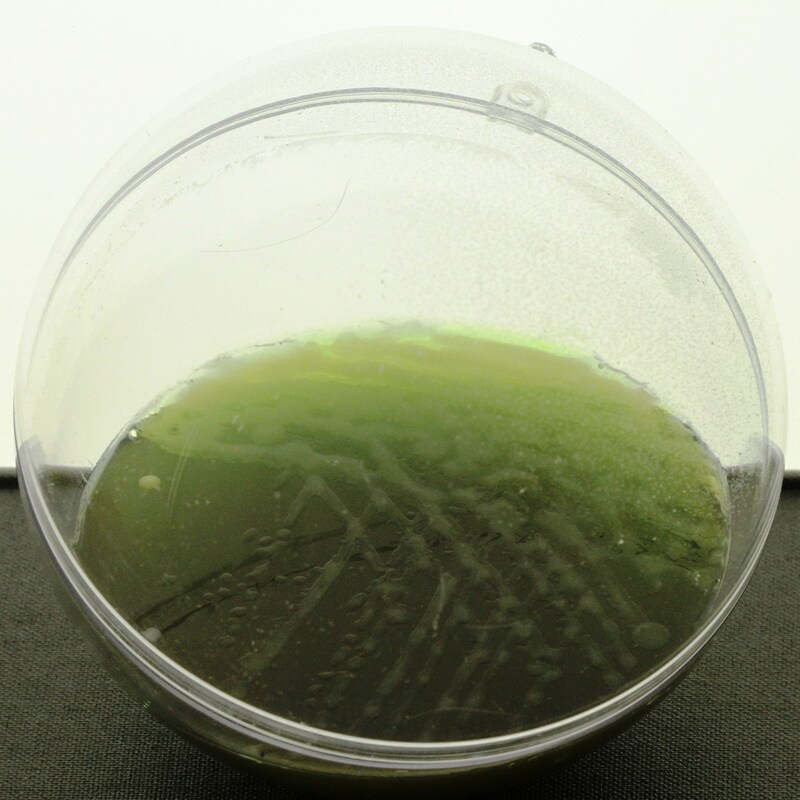 The bacterium Cupriavidus metallidurans was originally isolated in 1976 from a highly toxic pond in an abandoned metal factory, and is notable because it withstands high concentrations of many different heavy metals. It is anthropogenic, in that it has evolved to live in toxic and metal rich man-made environments. It has also been shown to produce metallic gold, when grown in the presence of salts of this element, and may even be involved in gold deposition in nature. The strangely beautiful pendant on this necklace (above) is an amalgam of this gold-producing bacterium, deposited bacterial gold, gold, and gold salts. 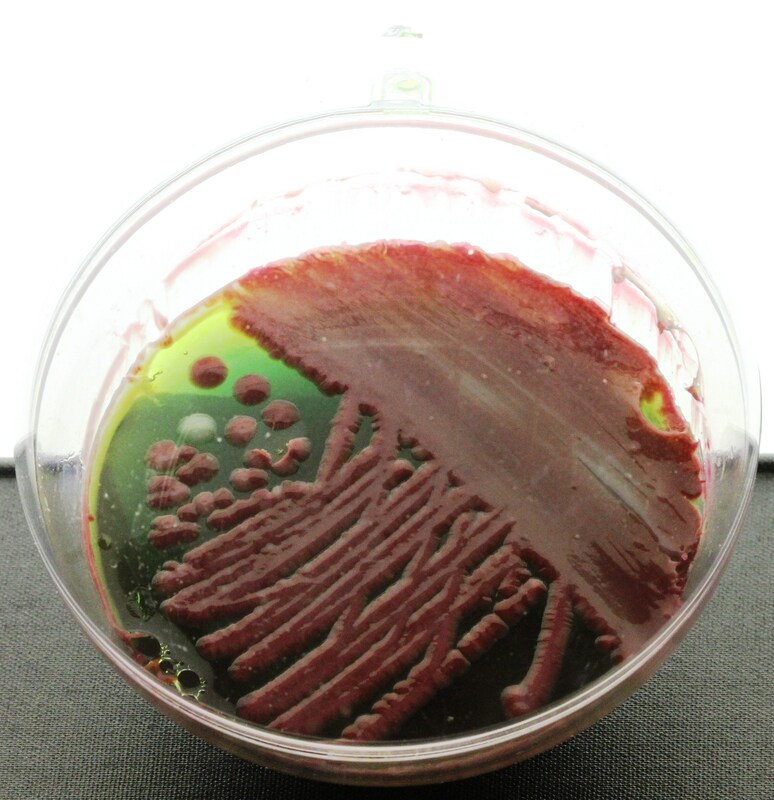 A saffranin stain reveals the presence of the bacterium. An anxiolytic handkerchief. Mycobacteria are an important group of bacteria which includes pathogens known to cause serious diseases in humans, including tuberculosis and leprosy. Whilst the diseases caused by this genus of bacteria can be devastating, one of its members, Mycobacterium vaccae, is ubiquitous in soil, and exposure to it has been shown to reduce anxiety, and through this effect, even the ability to learn. This hankercheif is impregnated with M. vaccae, and has been stained with a specific dye ( Ziehl–Neelsen), that uniquely reveals this bacterium. The gift of light an communication. 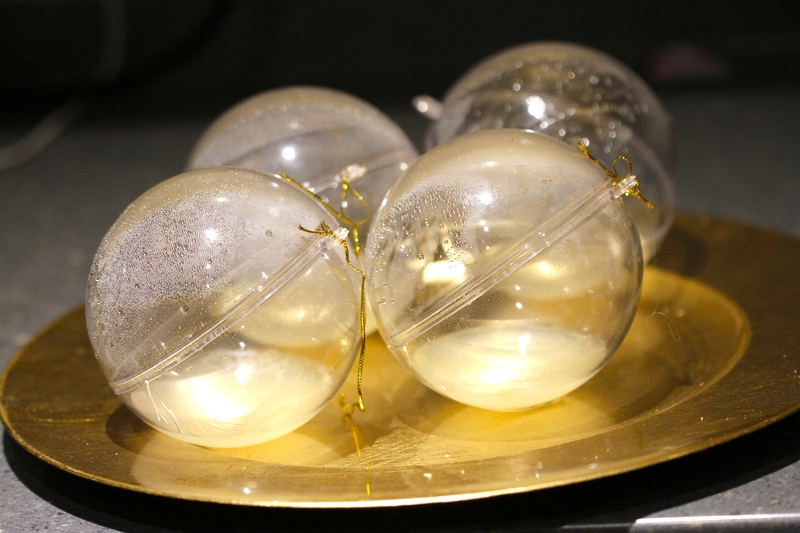 These baubles contain bioluminescent bacteria (glow in the dark). 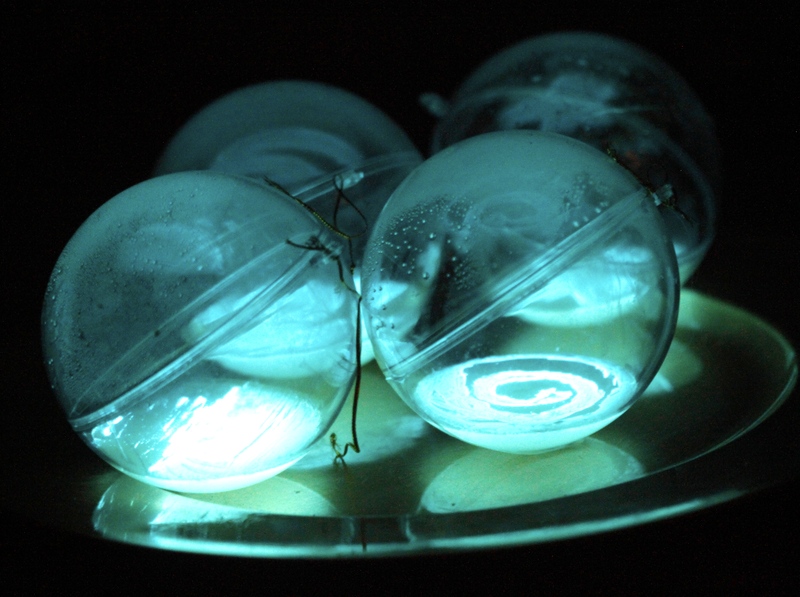 They provide an ethereal blue glow and will light up a room. By studying these bacteria, and how they regulate the production of their light, scientists learnt that all bacteria communicate with each other and through this have a simple social intelligence. Health: Penicillium chrysogenum was isolated from a cantaloupe bought from a grocery store in Peoria, Illinois. 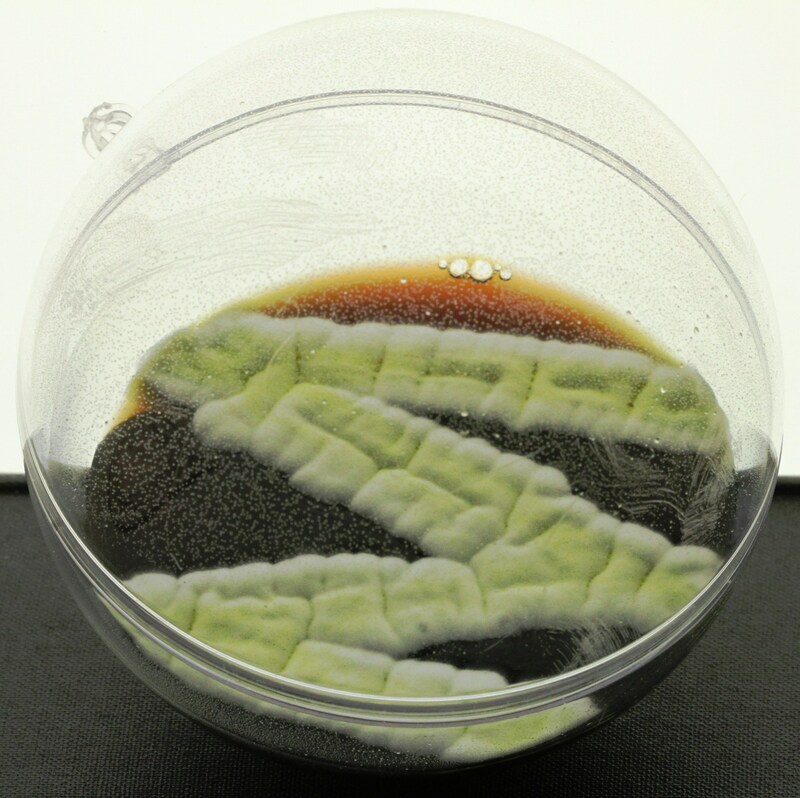 It produces several hundred times more penicillin than Alexander Fleming’s original cultures of Penicillium. This stain formed the basis of the processes needed to mass-produce penicillin in quantities great enough for distribution and mass use. 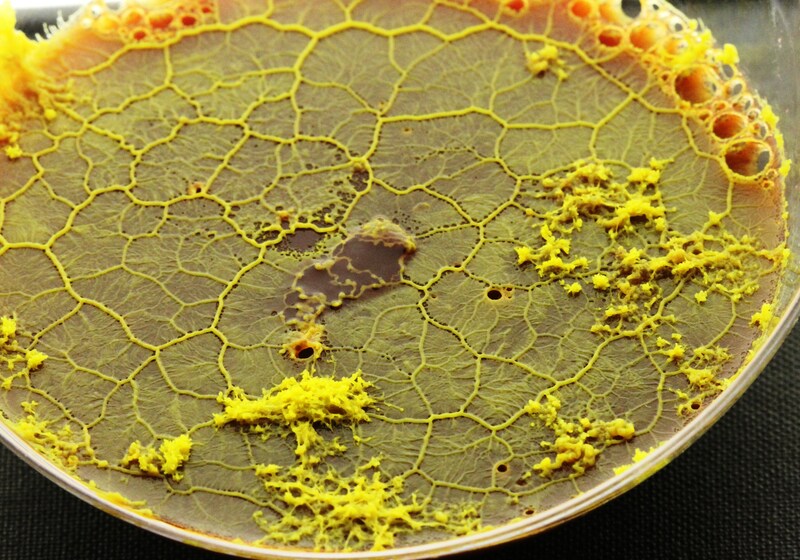 Intelligence:The slime mould Physarum polycephalum can solve mazes and plot the shortest routes between points in its search for food, and has a memory. 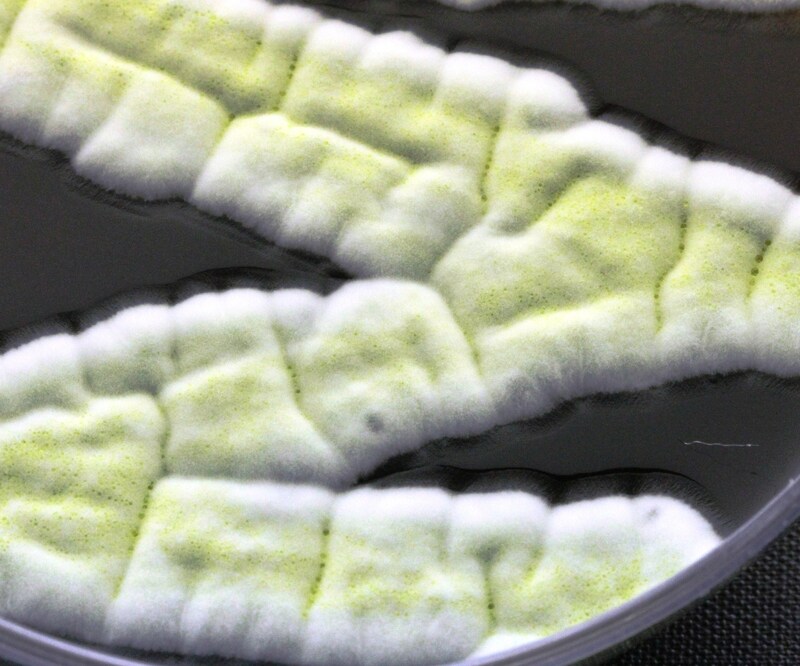 Fashion Futures: like many bacteria Gluconoacetobacter xylinus produces potentionally useful polymers. This particular bacterium produces cellulose nanofibres which may form the basis of novel textiles and biocompatible replacement body parts.